Ruby Stone belongs to the category of the costly gemstones. It is a red colored gemstone. Wearer of the unblemished ruby enjoys wealth and property and is blessed with children. He becomes fearless, and is protected from afflictions, sorrow and disasters. He becomes virile and his will power and spirit is strengthened. He occupies a respected position in the society. A blemished and defective Ruby gemstone, or one with a black hue brings troubles for the wearer. If the birth stone is dull, the wearer's brother gets into distress. Double colored ruby causes distress to the native and his father. The stone with a red sign causes quarrels and disputes. The gemstone with four spots or signs creates fear from wounds and weapons. If ruby gemstone is dusty coloured it causes stomach disorders and childlessness. If there is a depression on the gemstone, the wearer suffers from ill health and loses vitality and stamina. If the ruby is inflicted with many flaws it may even bring death. It is also believed that if the stone loses its color, the wearer is about to become the victim of some distress or disaster. It regains its color when the trouble is averted or over. 3. Any Ruby stone when rubbed on a stone and the stone shows signs of rubbing and also the Ruby does not lose its weight, it is considered to be of a superior quality. 1. Ruby Stone may be silky. 2. Ruby Stone may be dull, that is devoid of brilliance and luster. 3. 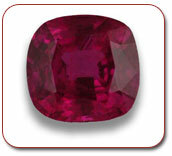 Ruby Stone may display an ambiguity of colors. 4. Ruby gemstone may be brittle or with cracks. 5. Ruby stone there may be lack of water in it. 6. There may be some cracks in the texture of Ruby Stone. 7. The Ruby Stone may be smoky. 8. The Ruby Stone may be dirty or filthy. 9. Ruby gemstone may have some on its surface. Suitability of Ruby Gemstone According to All Ascendants (Lagnas). For the Aries (Mesha) Ascendant Sun is lord of the fifth a trine and is a friend of Mars- the lord of the Ascendant. The natives of this ascendant will profit considerably by wearing a Ruby Gemstone. They will become intelligent and spiritually evolved. In the birth chart of Taurus (Vrishabh) Ascendant Sun is lord of the fourth house but Sun being an enemy of Venus who is the lord of the Ascendant. For this reason alone, ruby stone should be worn only in the major period of Sun. It will give good results if Sun is in its own sign or in the tenth house. Wearing a Ruby birth stone will give mental peace, success in education, gains of land and property, happiness from mother and comfort of conveyances. For Gemini (Mithuna) Ascendant Sun is lord of the third house. It will not be useful for the native of this Ascendant unless Sun is in its own sign in the third house. Even then it should be worn in the major period of Sun when it will make the native courageous and successful in all his ventures. For Cancer (Karka), Ascendant Sun being the lord of the second house, which is also the house of wealth. Sun is also a friend of Moon, who is the lord of Cancer Ascendant. If a native experiences loss or lack of wealth or trouble in eyes due to affliction of Sun in the chart, wearing a Ruby will prove beneficial. The second house is also a Maraka house (house of death). Therefore, it will be beneficial if Ruby gemstone is worn along with Pearl, which is the gemstone for the lord of Cancer Ascendant. The beneficial results will be more powerful in the major period and sub-periods of Sun. For Leo (Simha) Ascendant Sun is lord of the Ascendant. Ruby is, therefore, the most necessary gemstone for this Ascendant. Wearing of Ruby is absolutely necessary when sun is afflicted in any way in the horoscope. Ruby will give protection from enemies and ill health besides giving long life and energy to the body. It will also increase the spirituality of the native. For the Virgo (Kanya) Ascendant Sun is lord of the twelfth house. Therefore, it is not advisable to wear a Ruby. However, a ruby may be worn if necessary but along with an Emerald (the gemstone of Mercury-lord of Virgo Ascendant) during the major period of the Sun. For the Libra (Tula) Ascendant the Sun is the lord of the eleventh house, which is the enemy of Venus - the lord of the Ascendant. The native of this Ascendant may wear a Ruby when there is loss of wealth on account of ill disposition or affliction of the Sun in any way. If the Sun is in its own sign, the wearing of Ruby gemstone will make the native very fortunate and wealthy. He will be famous, honored and will own conveyances and property. The wearing of Ruby will also improve his health and longevity. The beneficial results will be more pronounced during the major period and sub-periods of Sun. For the Scorpio (Vrischik) Ascendant Sun is lord of the tenth house. Sun being the friend of Mars, who is the lord of Scorpio. Consequently, wearing of a Ruby stone for the native of this Ascendant will give him honors, promotions and political power. He will achieve success in his business dealings. If Sun, as lord of the tenth is in tenth, it will give rise to a powerful Raja yoga and wearing a ruby will substantiate the gains. The wearing or Ruby will prove helpful if there are obstructions in achievement of success on account of affliction of sun in the horoscope. The results will be more particular and powerful in the major period and sub-periods of Sun. For the Sagittarius (Dhanu) Ascendant Sun is the lord of the ninth house, which is also the house of fortune (Bhagya). Sun being the friend of Jupiter, who is the lord of the Ascendant. Wearing of ruby for the natives of this ascendant will be beneficial more so when sun is in its own sign and posited in the ninth house. In addition it will also enhance the longevity of the father of the native. For the Capricorn (Makar) Ascendant Sun is lord of the eighth house. The natives of this Ascendant should not wear ruby because sun is the enemy of the Saturn who is the lord of the Capricorn ascendant and also it is the lord of the eighth house. If, however, the Sun is in its own sign in 8th, Ruby may be worn in the major period of Sun. It will bestow longevity. For the Aquarius (Kumbha) Ascendant the Sun is lord of the Seventh, a Maraka house (house of death). Sun is also an enemy of the lord of the Ascendant. So natives of this ascendant should not wear ruby stone. However, if the Sun as lord of seventh is in its own sign, Ruby may be worn in the major period of Sun.